We know that “PR” is still a bit confusing to most because we often get asked, “What exactly is PR?” So we thought, what better way to explain than to give you a real life example. 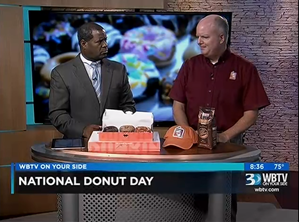 June 3 marked National Donut Day and our client, Dunkin’ Donuts, tasked us with making a big splash in Charlotte to build positive brand awareness and generate restaurant foot traffic to the 50 (approx.) stores in the metro area. Challenge accepted! We developed an integrated public relations campaign comprised of these key components: partnerships, media relations, event marketing and social media. To show our commitment to the Charlotte market and surprise and delight Charlotteans, we partnered with WFNZ to host a live radio remote at the WFNZ Coca-Cola Doghouse. As the radio DJs encouraged folks to swing by, Cuppy and Sprinkles greeted commuters while we surprised unexpected drivers with free donuts and coffee. Not only did we see happy faces galore from donut-eating commuters, but we also had tons of folks snapping pictures and we even snagged on-air TV coverage from a local station. The event also served as a great lever to make Dunkin’ stand out from other donut shops in print/online coverage. Localize, localize. Sure – the donut deal appeals to everyone (who doesn’t love a free donut?) but we knew we had to make the news local to our market to gain earned media coverage. How? Local spokesperson and local event (see above). From there, we followed a traditional media relations approach and pitched in-studio interviews, landing a spot with WBTV. We also secured coverage through targeted pitching to outlets, including The Charlotte Observer, Charlotte Five, Charlotte Agenda and Charlotte Restaurant Traffic. Our mascot Sprinkles even recounted the day in the Charlotte Five newsletter. 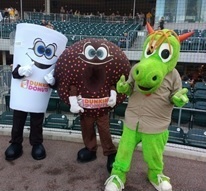 A sold-out Charlotte Knights Friday night game was the perfect way to connect Dunkin’s fun-loving brand with an audience of more than 10,000. 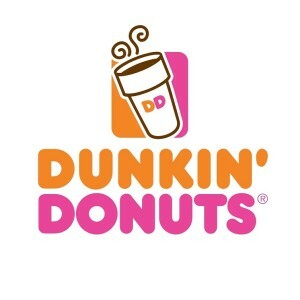 The partnership kept Dunkin’ Donuts top of mind throughout the game starting with a pre-game interview and first pitch thrown out by a franchisee. With a huge inflatable coffee cup in the concourse and the mascots all over the stadium, attendees couldn’t escape the brand. After they experienced a game full of Dunkin’-themed activities, including a t-shirt toss, gift card giveaway and coupons (to drive them in store of course! ), they received free coffee tumblers to keep them running on Dunkin’. 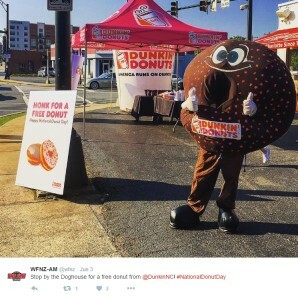 Tying it all together with social media, we leveraged Dunkin’s own channels, @DunkinNC and @DunkinSC Twitter, to share updates throughout the day and engage with donut day revelers. Local media outlets, including Creative Loafing, shared the local donut deal. 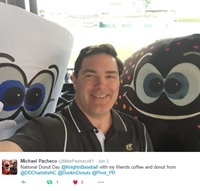 And, our friend and Charlotte Knights announcer, Mike Pacheco shared a selfie with Cuppy and Sprinkles during the Game. So, what were the results? Targeted, quality earned media placements. Positive brand awareness. Foot traffic in stores. A social media reach of more than 96,000 users. Check, check and check!